Neil Cawthorne (British b.1936) Horses : Mares and Foals in a landscape Oil on canvas Signed lower left 51 x 71cm (20 x 27¾ in) Neil Cawthorne Horses have always played a large part in Neil's life and he has ridden and drawn them for as long as he can remember. At the same time he started to paint seriously he was hunting with the Quorn and Fernie and this constituted much of his early work. He was greatly assisted in those early days by John Kenney who also lived and worked in Leicestershire. Over the following five years he had several exhibitions and painted an increasing number of racing subjects. 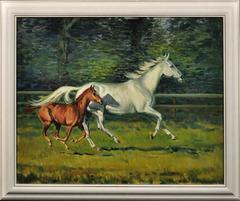 In 1971 he was commissioned by the Sporting Live to paint 'Mill Reef' and 'Brigadier Gerard'. In 1975 and 1976 he exhibited in America and London. During the past 15 years he has been fortunate to paint many Classic, Grand National and other big race winners. In 1979 he helped to found the Society of Equestrian Artists. Recently, amongst other work, he has executed a commission of the Canal Turn at Aintree for Hartell's inaugural sponsorship of the Grand National and was one of four artists invited to paint a picture of Royal Ascot to commemorate the Queen's Forty Years reign. He has produced several paintings which have subsequently been used for Christmas cards by the Spinal Injuries Association, the British Field Sports Society, the Animal Health Trust etc. Whilst most of his work is taken up with commissions, he still finds the inspiration of the Racecourse, Training Grounds and Hunting Field as strong as ever and is still concerned with conveying their movement, atmosphere and excitement. He feels it is most important to be involved at first hand with one's subject and, as well as riding out regularly, he has spent a great deal of time at stables generally which has helped him to observe, absorb and 'feel' both the horses and the way of life. For some time he held an Amateur Licence and over the past ten years has owned a number of racehorses He has paintings in a number of Private Collections, including those of: HRH The Prince of Wales Duke of Beaufort Lord Harrington Lord Vestey P. Mellon, Esq Bertram Firestone Major Ivan Straker Ivan Allen, Esq.